The Montgomery Dam is located on the Ohio River near Beaver, Pennsylvania. It was completed in June of 1936 and includes ten vertical lift gates and two lock chambers. 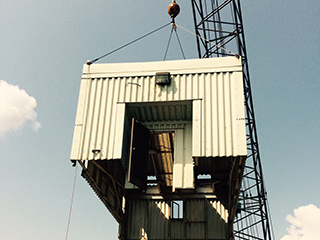 Vertical lift gates are operated by large chains hooked to machinery mounted on tall concrete piers. The vertical lift gates are used to control the upper pool for navigational purposes. 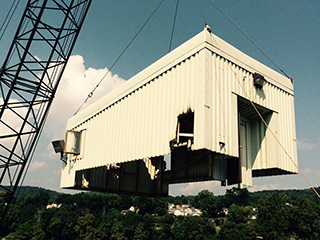 In June of 2015, Mahan was awarded a contract to replace three vertical lift gates at the Montgomery Dam. 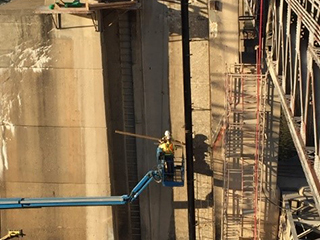 This project, currently in progress, consists of the removal of existing dam Lift Gates 6, 7 and 8 including associated components. 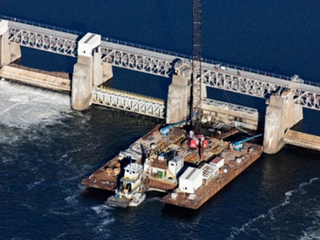 The project also includes modifications to Pier machinery housings, sill modifications, and miscellaneous pier concrete repairs as necessary for installing the new gates. The primary items of work are installation of new Government-furnished vertical lift Gates 6, 7 and 8 including embedding the gate frames and guides in second-stage concrete, installation of lift chains, and repair and re-lubrication of the gate lifting equipment and brakes. 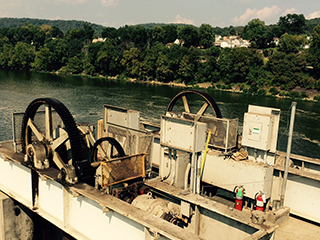 All work is being completed from a floating plant on the Ohio River working from the downstream pool. The construction sequence begins with removal of the machinery houses located atop the piers at either end of the gates. With dewatering bulkheads in place, Mahan crews then remove the old gates by cutting them into three pieces for handling. Once the old gates have been removed, portions of the existing piers are carefully removed. Upon completion of all demolition work, new embedded gate tracks, reinforcement, and other embedded metals are installed to precise tolerances prior to placing new concrete. 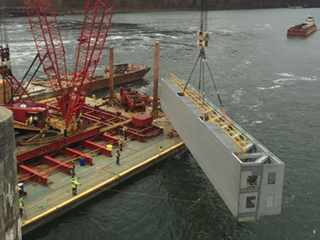 The Government furnished gates are then installed in three pieces commencing with installation of the two end truck pieces weighing approximately 55,000 pounds each. The two end truck pieces are temporarily tied together an operated through the opening and closing cycle prior to installing the gate leaf. Once this testing is completed, the approximately 145,000 pound gate leaf is installed and permanently connected to the end trucks. Finally the refurbished brakes and machinery houses are re-installed and each gate is tested through multiple complete cycles.